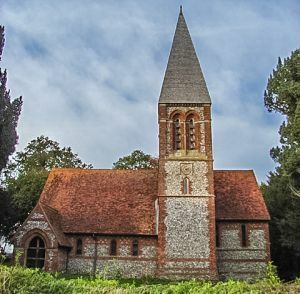 A Victorian church in a countryside setting, St Mary's was built in 1875 to a design by JL Pearson for Thomas Fowle of Chute Lodge. The church was intended to serve the new parish of Chute Forest, which was later combined with the parish of Chute, making St Mary's redundant. At the time of its construction, the parish of Chute Forest only had 188 inhabitants, but this was the Victorian period when religion was resurgent and church-building (and rebuilding) was at its height. Curiously, the Fowles family did not provide a house for the vicar, who settled outside the parish. Thomas Fowle also paid for the church of St Nicholas in Chute itself, and again used JL Pearson as the architect. It is not surprising, then, that both churches are in the same style. Visit Wiltshire describes St Mary's as 'a low budget church', which perhaps doesn't give JL Pearson enough credit for his inventive solution to creating a new church. The building is constructed of a mix of flint and brick with a tile roof, punctuated with a striking spire. Unusually, the nave and aisles are covered by a single span roof, with an open trussed design of timber rafters. By contrast, the vestry has a barrel-vaulted roof. The interior of the church uses brick for the walls, piers, and arcades, while the pulpit, font, and reredos are made of beautifully carved stone. The church windows hold stained glass by the famous Victorian firm of Clayton and Bell. The chancel floor is decorated with encaustic tiles. The three-stage tower is surmounted by a striking spire which acts as a landmark for some distance around. The tower originally held a ring of 6 bells, cast by the famous Whitechapel Foundry in 1871, but the bells were moved to St Nicholas Church in Chute when St Mary's was declared redundant in 1976. The church has been restored and is now cared for by the Churches Conservation Trust. As of this writing, the church is kept locked but there is a keyholder nearby.